I love being an OT, the rewarding nature of the job, the ability to help others, and the feeling that I am making a difference in someone else's life. This all equates into high job satisfaction. But I wanted more, and I wanted a business to call my own. The problem is, I don’t like a boring routine. I struggle with working 9-5, and I am always looking for something new and different. I went through 3 jobs in 3 years because I got bored. When I was younger, I had dreams of being my own boss and I always saw myself doing something more than punching the clock every day. After I had my daughter in 2014, I decided it was time to do something different. 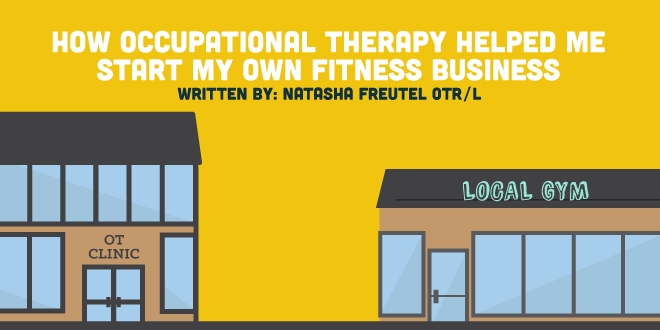 I didn’t want to give up my Occupational Therapy job that I worked so hard for, but rather split my time between healthcare and my passion; personal training. I started my own fitness business, Fit Mama Santa Barbara, where I provide online and private personal training for women of all ages. Now to many people this may seem like a step backward. Personal trainers require little to no education, often nothing more than a weekend course. Why would I put all this work into getting my Masters just to run a fitness business? I struggled with this for awhile, and it held me back from starting my own fitness business earlier in my career. It wasn’t until I saw the value in my education, outside of what credentials it provided me. College teaches you how to learn and problem solve. It gives you the tools you need to connect with others, manage your time, and be successful in business and life. But What About My Masters Degree? My degree in Kinesiology and Occupational Therapy provided me with the credibility I needed to get ahead in the fitness industry and business. I've been provided with opportunities to collaborate with doctors and other healthcare professionals, as well as speak as a guest expert on fitness and rehabilitation after childbirth or injury. These opportunities didn’t present themselves because I was a personal trainer, but rather because I am a professional, educated woman with knowledge and experience, who can hold her own in a room of healthcare providers. These opportunities didn’t present themselves because I was a personal trainer, but rather because I am a professional, educated woman with knowledge and experience, who can hold her own in a room of healthcare providers. My skills as an OT are also essential in my role as a personal trainer and as a fitness business founder. I also learned a lot of new skills such as marketing, photography, social media, writing, blogging, building websites, and most recently public speaking and video creation. These are all things I would have never thought of doing before starting my own fitness business. I am also always using my assessment and clinical judgment as I see my clients through their workouts. Are they compensating for pain and developing poor movement patterns? What feedback can I give them to improve their proprioception and help them get the most out of their workout? My clinical skills and knowledge of the human body allow my clients to reach their health and wellness goals without putting themselves at risk of injury. It’s important to remember that just because you went to school to be an OT doesn’t mean you can’t do anything else. The skills we learn are invaluable and transferable across all aspects of life. Starting my own fitness business has been one of the most rewarding and challenging things I have ever done. Every day is a learning experience, and it has opened up the opportunity for me to grow not only as a professional but also as a person. I am so grateful for my ability to still work as an OT, but also do something that I truly love.